JEE (MAIN) Phase (I): First 3 rankers of Vidarbha are from ICAD. ICADian Vedant Saboo topped Vidarbha with 99.9764 perceen. Eeshan Jain scored 99.9676 percentile, Chinmay Ratnaparkhi scored 99.9613 percentile. Top 5 ICADians who scored unprecedented 300+ score or 99.9 percentile above are Vedant Saboo, Eeshaan Jain, Chinmay Ratnaparkhi, Rahul Pathak, Atharva Wardhade. 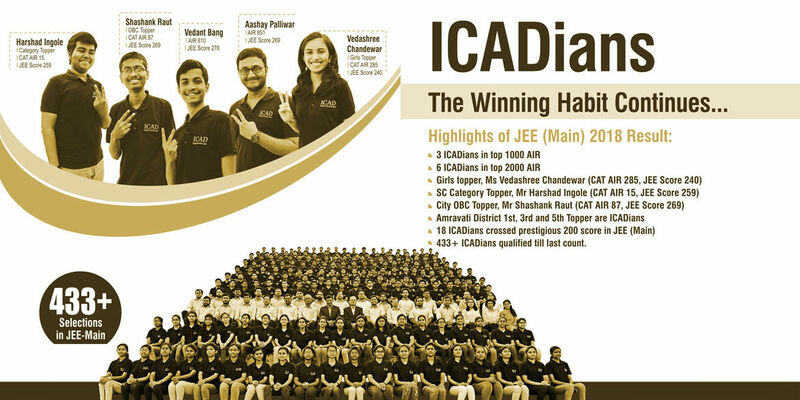 600+ selections are expected in JEE(Main) from ICAD. ICADian Chinmay Ratnaparkhi qualified INCho (Indian National Chemistry Olympiad). He is now amongst top 42 students of India. Only student from Nagpur to qualify for INChO. 4 ICADians Chinmay Ratnaparkhi, Eeshaan Jain, Atharva Warhade & Rahul Pathak qualified NSEC (National Standard Examination in Chemistry). ICADian Chinmay Ratnaparkhi qualified NSEP (National Standard Examination in Physics). 3 ICADians Eeshaan Jain, Yash Agrawal & Abhiraj Mengave qualified NSEA (National Standard Examination in Astronomy). 7 ICADians Chinmay Ratnaparkhi, Eeshaan Jain, Atharva Warhade, Vedant Saboo, Aryan Hingwe, Indrayani Tayade & Akash Suryawanshi qualified KVPY. The tally is now the highest in Vidarbha! In last 8 years 38 ICADians have cleared KVPY (Kishore Vaigyanik Protsahan Yojana). 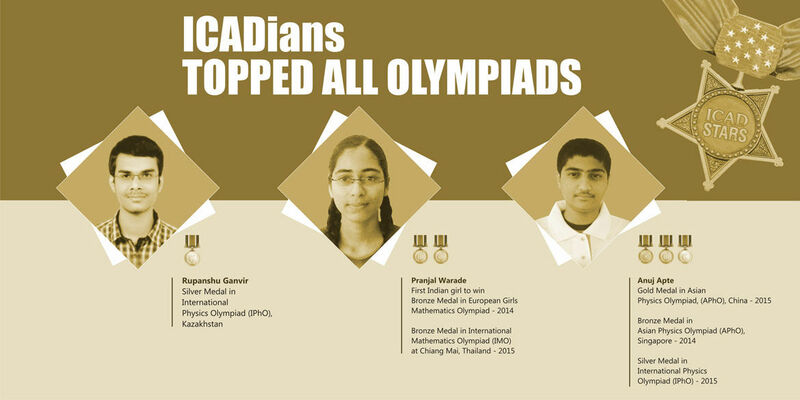 3 ICADians Kalyani Sainis, Raghav Sapre & Soham Dahane qualified RMO (Regional Mathematics Olympiad). Massive 433+ ICADians qualified JEE MAIN 2018 till last count. 3 ICADians in Top 1000 AIR. Girls Topper, Ms Vedashree Chandewar (CAT AIR 285, JEE Score 240). SC Category Topper, Harshad Ingole (CAT AIR 15, JEE Score 259). City OBC Topper, Shashank Raut (CAT AIR 87, JEE Score 269). 18 ICADians crossed prestigious 200 score in JEE (Main). 6 ICADians crosses prestigious 240 score in JEE (Main). 1st Amravati District Topper Mithila Sanor (JEE Score 235) 3rd Amravati District Topper Deepshri Sharma (JEE Score 202) and 5th Amravati District Topper (JEE Score 198) are ICADians. Massive 460+ ICADians qualified JEE-MAIN 2017. 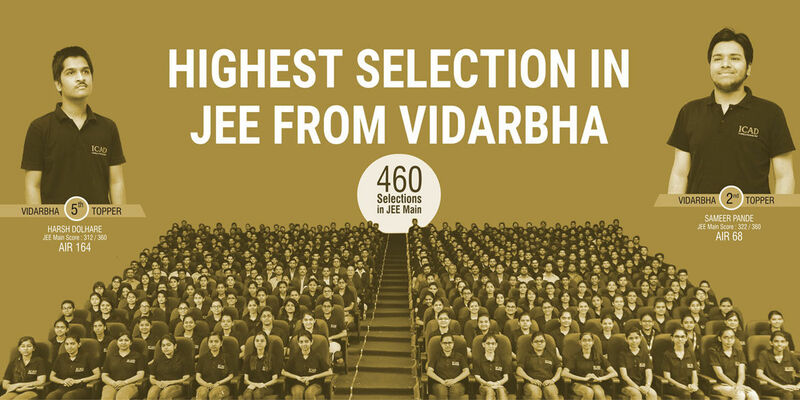 The highest selection in Vidarbha. 109 ICADians qualified JEE-ADVANCED 2017. ICAD reached 3 digit marks in Advanced selections. Sameer Pande (AIR 104) stood top ranker from ICAD now he is IIT-Delhi. Harsh Dolhare (AIR 855) is the second ranker from ICAD, is in IIT-Powai. 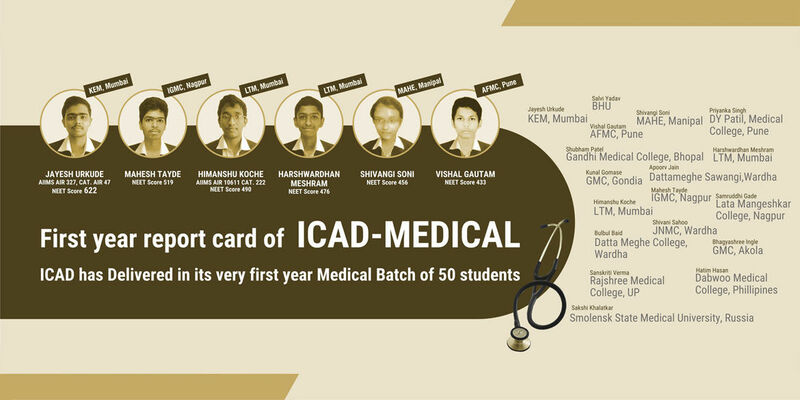 In its very first year of medical batch of limited 50 students ICAD has given wonderful results. 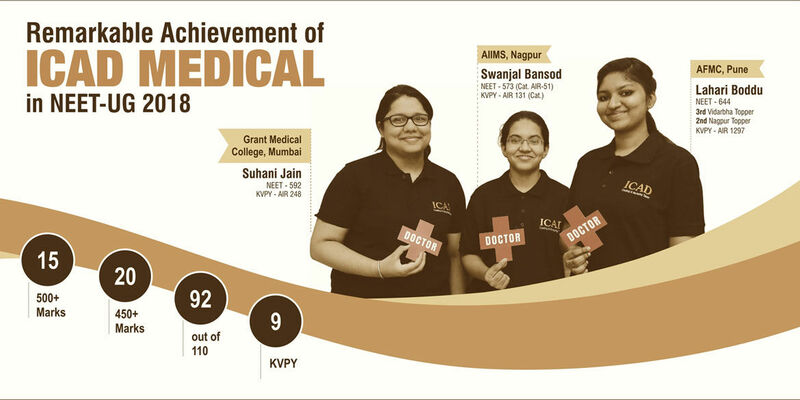 First batch ICADians are studying in Jayesh Urkude (NEET Score: 629) is studying in King Edward Memorial Hospital Mumbai. 45 ICADians secured 90% + in boards. 2 ICADians Kalyani Saynis & Indrayani Tayde cleared RMO 2017. Welcome to ICAD School of Learning! We realize that this is the time of excitement and hope for a better future. We assure you that you are at the right place to pursue your dream. You are entering the entire new academic system that you have encountered before. You will experience the change in study pattern and the need of more efforts to surpass the challenges posed by one of the most competitive examination of the world. Best and experienced faculty of the field, disciplined and well trained administrative staff, result oriented atmosphere and most efficient system of India you will get in ICAD School of Learning. COME, FEEL IT FOR YOURSELVES! Hello, I was in ICAD's first 3-year Integrated batch. Cracking JEE is actually not at all tough, provided you have proper guidance, good discussion group,healthy attitude, and a spirit to learn something. With ICAD, I had the first two, and the faculties at ICAD developed the other two into me. As said by the wise, there's more to the journey than the destination itself. When I look back at the past three years. I feel nostalgic for each and every day of the journey was really fun. Any coaching institute can teach the subject, but my teachers taught me to actually enjoy the process of learning, and I'm really thankful to them for that. Also, the constant motivations and inspirations kept my spirits high. In the end, I didn't only crack JEE Advanced with an AIR of 24 but I also performed reasonably well in various Olympiads with finally getting a Silver Medal at IPhO-2014, Kazakhstan. Today, I can say without any hesitation, that joining ICAD was one of my best decisions. I would also like to thank my family, Kayande Sir, and my friends for supporting me throughout and being a constant source of inspiration. Happy Learning. The first thing that ICAD made me realize was I am NOT what I think I am. I have much hidden potential, and I need to extract it from myself. I was like a canvas in a painter's hand, and I thank ICAD for making a portrait out of it. ICAD gave me knowledge, but more than that, it blessed me with the habit to think on my own. With regular classes and interactive sessions with teachers, I was sure that no stone would be left unturned in my JEE preparation. Along with this, I had real smart guys as my classmates, thus success had beckoned to me from the beginning. I never felt tired studying long hours in ICAD, indeed I began calling ICAD my second home. The assignments that we got were wonderful and challenging. Thus the perfect combination of good teachers and helping friends has made me reach these heights. Lastly, I would like to thank Mujumdar Sir, Mehta Sir, Satish Sir, Vaidya Sir and of course Sarang Sir for their guidance and blessings. Three cheers for the ICADian spirit ! I take here the opportunity to express my gratitude towards whole team of ICAD SL. Throughout the three years of my journey towards the iits, ICAD was with me.. The teaching is very high standard and precise. The teachers make u feel interested in a topic which u may find boring else.. They teach u till that point till all your doubts are not clear.. Hats off to the faculty!! The material provided in ICAD was also quite nice. 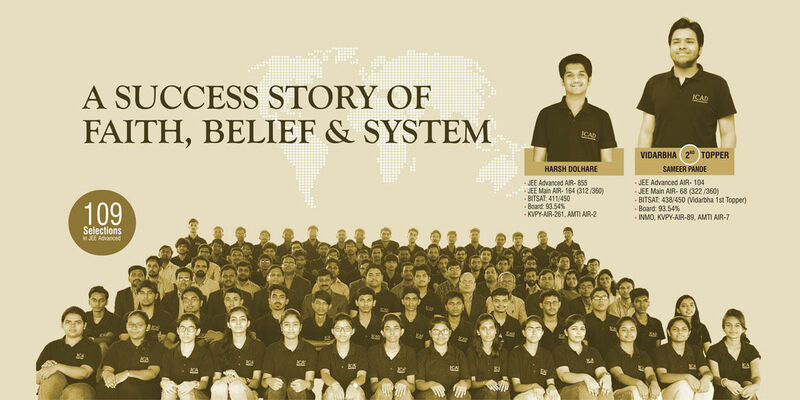 All tests were a great help as mock jee.. And my personal experience being a part of integrated batch was phenomenal.. The last half year available for revision helped a lot.. I would advise the students to trust ICAD and would really help them.. Three cheers for ICAD... Hip hip... Hurray!!! 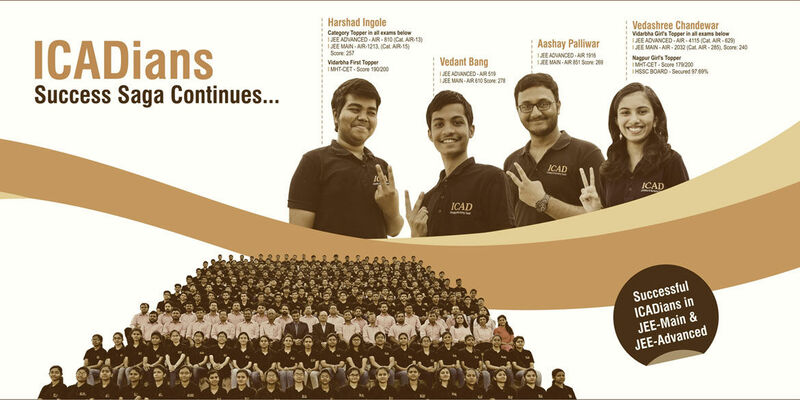 When I joined ICAD, I came to know that they had planned more than 180chapters meticulously in a duration of 2 years. I started trusting ICAD from the very beginning.Their team of expert teachers taught me everything from the fundamentals of P.C.M. to the final polishing required to excel not only in JEE but all competitive examinations. Moreover they have provided me with timely advice, valuable counseling & above all a healthy environment. The role of ICAD in my success is like that of a Philosopher's stone which transforms any metal into precious gold. Teaching method at ICAD is concept oriented rather than exam oriented. It enables a student to perform better in any competitive exam like IIT-JEE, AIEEE, BITSAT etc. as well as the Board exam. I felt that the continuous testing and good library were also the advantages. Thanks ICAD for helping me to achieve the goal of getting into the best engineering college of India!! !